AP School Games Federation Appointment of District School Games Secretaries for two years during 2018-2020 as per Rc.No:04, Dated:24/07/2018/AP School Games Federation Appointment of District School Games Secretaries for two years during 2018-20 -Instructions issued as per RC.N0.04/P54/2018, Dated: 24-07-2018. AP School Education School Games Federation Appointment of District School Games Secretaries for two years during 2018-20 -Instructions issued as per RC.N0.04/P54/2018, Dated: 24-07-2018. 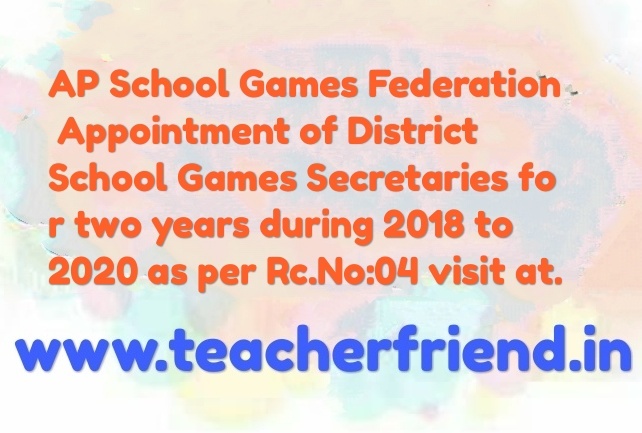 All the District Educational Officers in the state are informed that as per the School Games Federation of Andhra Pradesh norms the District Level Organising Secretaries are to be nominated by the District Educational Officers from among the School Assistant (Physical Education) based on the service rendered, qualifications and interest in conducting School Games. The tenure of the post for two (2) years. The said period of District School Game Secretary treated as on duty. The District Educational Officers/ DVE0s/ RIOs are requested to nominate new Organising Secretaries for U/14, U/17 from School Education and U/19 years (Intermediate Education) in place of District existing School Games Organising Secretaries, who have completed two (2) years.are. The senior most willing S.A (P.E) (School Education) for under 14 Et under 17 category / P.D (Junior College) must be nominated for Under 19 years. When S.A (P.E) is not available or unwilling, then the senior most willing PET must be nominated. Teachers who posses higher qualifications in Physical Education. The teachers working in Zilla/Government Parishad must be given preference. When there is a tie in first two points of selection, the selection should be based on the next two points. The SA (PE), who may get promotion in 3 months as HM/MEO/Lecturer DIET/RIPE shall not be preferred. When the person so nominated gets promotion, another teacher shall be appointed immediately duly following the above procedure. The teacher, who already worked as District School Games secretary earlier, cannot be nominated within a span of 6 years from the year of completion of his/her tenure. Therefore, all the District Educational Officers are requested to nominate the District School Games Secretaries immediately duly following the above norms/procedure and furnish the List of the teachers so nominated to this office immediately. There must not to be any deviation in the above criteria unless and until there is specific permission from either the CSE or Principal Secretary to Government.